When you are working with Machine Learning there are many things you need to keep an eye on. You need to prepare the data, deal with any missing values and you need to select an algorithm you will be using for you model. Choosing an algorithm can be a difficult one though. Azure Machine Learning alone has around 25 different algorithms, each one with its own pros and cons. 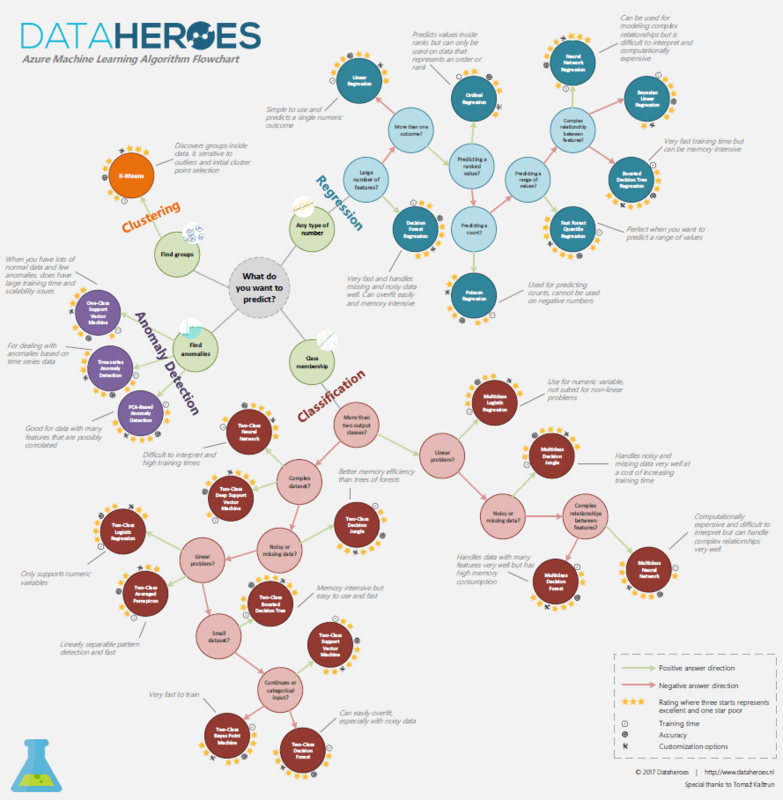 To help out beginning Advanced Analytics and Azure Machine Learning users Dataheroes designed a flowchart to help you select an algorithm quick and easily! The Azure Machine Learning Algorithm Flowchart guides you to an algorithm based on questions, just follow the green (positive answer) or red (negative answer) arrows! At every algorithm a rating is displayed for three properties: training time, accuracy and customization options. The more stars, the better the algorithm performs for that specific property. Almost every algorithm also has a short description text where pros and cons of the specific algorithm are described. Got any questions about the flowchart? Let me now!